Last night’s Mother’s Day-themed, Amy Schumer-hosted Saturday Night Live may have played it too safe with all those actual cast members’ moms around. (The cold open jettisoned the show’s traditional Trump material for a charming parade of star’s mothers asking why they do so much Trump material.) 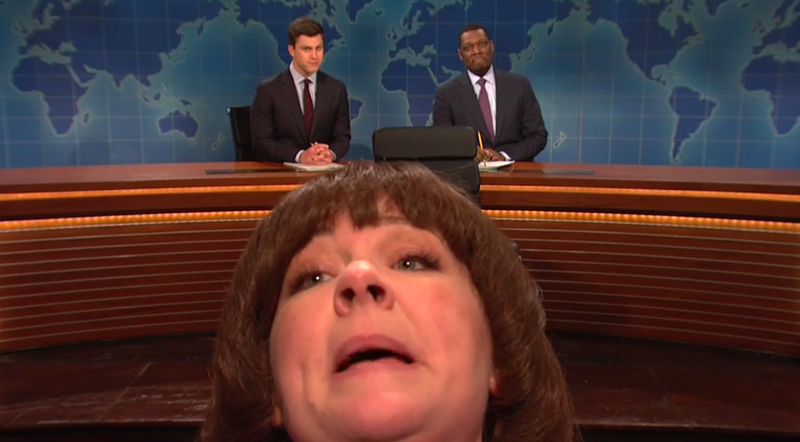 But it was the one fake mom in the house that brought said house down, as Melissa McCarthy unexpectedly popped up on Weekend Update as co-anchor Michael Che’s adorably doting stepmother. Wearing a “world’s proudest stepmom” sweatshirt (complete with Che baby picture decal), McCarthy interrupted Che’s Rudy Giuliani joke to give him a quick Claratin (“You’re a little froggy.”) before sticking around to basically be the sweetest, most mom-like stepmom ever. (Hands up if you can see your own mom giggling uncontrollably when she realizes her face is being blocked out by an onscreen picture of Monica Lewinsky.) Doing the quintessential mom move of overpraising everything her Mikey does while assuring him (and the American TV audience) that’s she’ll just stay out of the way, McCarthy’s Mrs. Che marveled over Che’s cleverness (despite not paying much attention to all those political things), his handsomeness (“Where did these shoulders come from?”), and his grade school poetry skills, tearing up at the memory of little Michael’s ode to horseshoe crabs. But it was the last bit of the appearance that made this the Mother’s Day sketch you’re gonna want to show your mom. Urging his stepmom to read the final joke off of the cue cards herself, Che could only laugh warmly along with co-anchor Colin Jost (and the rest of us) as the near-sighted McCarthy loomed right into the camera. Reading off Che’s heartfelt appreciation for “the best stepmom in the world,” the stunned McCarthy welled up in gratitude, putting a deliciously sweet capper on her hilarious extended cameo. Happy Mother’s Day, everyone—call your mom.